Jeffery Deaver is one of the most popular contemporary thriller authors who brought us the well-known Lincoln Rhyme series. Reading the Jeffery Deaver books in order involves picking up this series and a few other shorter series as well plus several standalone novels. Here are the Jeffery Deaver books in order for his popular Lincoln Rhyme series, the Kathryn Dance series, the John Pellam series, his Rune trilogy, the new Colter Shaw series, and other books he has written, based on the publication order. The series order is listed in brackets for each book. Jeffery Deaver (website) was born in 1950 in Glen Ellyn, outside Chicago, Illinois. He attended the University of Missouri from where he obtained a bachelor degree in journalism, after which he worked as a magazine writer for a bit, before returning to study law at the Fordham University in New York City. After getting his law degree, he worked as a corporate lawyer on Wall Street. In his spare time, however, he kept on writing and trying to get his books published. After several rejections (or self-terminations due to the author realizing that what he wrote were not up to par), his next work, Hoodoo, got accepted by a smaller publisher. His next book, Always A Thief got accepted eventually as well. Reading the Jeffery Deaver books in order is a real treat for every FBI style thrillers reader. The author has written close to 30 novels which have been translated into 25 languages and were sold in over 150 countries. My first encounter with his books was with his debut novel, The Bone Collector. Needless to say, I was hooked. It was published in 1997, and two years later the overnight hit movie with the same title featuring two of my favorite actors, Denzel Washington and Angelina Jolie played in theaters. I have to say, the actors did a good job transplanting what the book had to offer to the big screen. His first serious debut novel, The Bone Collector, was not intended to become part of a series. But I’m glad it did because Lincoln Rhyme is one of the most interesting characters I met in books. A quadriplegic from the very first book, he is up against the most ruthless of criminals, and only his sharp wits and his above-average mind and intellect helps him solve crimes after crimes from a physical impairment position where most people would give up on the world and will to live by now. 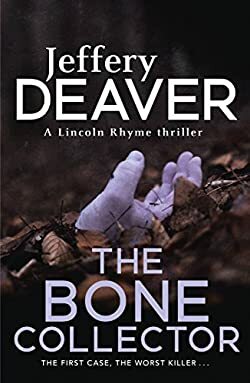 In the new Jeffery Deaver book, The Cutting Edge, which is book #14 in the series, Lincoln Rhyme and his bride and partner, Amelia Sachs, return from their honeymoon in Italy just in time to realize that their home city, New York, is under terror by a serial killer. Newspapers and media called him Fiancé Killer and as usual, the name stuck. The killer’s MO is following newly-engaged couples to jewelry stores and killing them before they get the chance to actually buy the wedding ring. When the killer escapes once again, the police asks Lincoln to kindly lend a hand and his unbeatable forensic expertise in catching the monster roaming the New York City streets. But the closer Lincoln and Amelia get to the killer, the nearer he gets to them. Now, the couple has to stop them before their lives are stopped…for good. 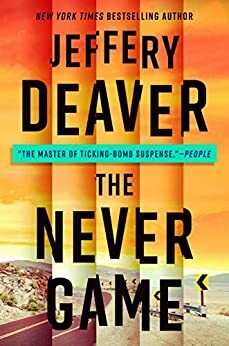 The new Colter Shaw series starting in 2019 features private investigator / excellent tracker / problem solver guy who, in The Never Game, is tasked by a man to find his missing daughter. Shaw is perfect for the job since, as the son of a survivalist family, he has uncanny tracking abilities, and he puts those to good use while he is traveling across the country to solve case that need his particular flavor of expertise. Soon, however, a second victim goes missing, and all signs point to a particular video game which has as topic survival in unfriendly places after being abandoned there. Could there be a connection between the two cases and to the said video game? The series starts with the short novella, Captivated, which introduces us to Colter Shaw, where he is already working the case of a missing woman who might have fled from her husband and gone to a retreat in Indiana. But the more he investigates, the clearer it is that things are a bit more complicated than initially anticipated. Yes, it was The Broken Window, Lincoln Rhyme #8. Can you tell me the title of the book that is about the use of data (loyalty cards) in frame people for murders? Thamnk you.